I have thought a lot about joining up the 15 minute challenge since a podcast about it a year ago. I have also not been disciplined enough to always do something on a certain day, or really rigorous in my quilting experiments that I have set up and then long forgotten to get ahead on quilting projects. But, I am considering having a Marching Along in March where the challenge is similar to Kelley’s May Mayhem and all you have to do is sew for 15 minutes a day in march. If I want to set up something like that, I have to start somewhere, and what better way than posting a 15 minute challenge results from the last week, and then linking it to Life in Pieces Blog – at least once anyway. And to spice up the information, it usually goes out with a graphic, so I am trying that too. This whole week has been taken up by progress on my Exothermic quilt blocks. No where do I actually say I definitively have worked for 15 minutes, AND this list for me can include things that make sewing easier that are either necessary prep items or something more than just twittering & blogging. Also when not journaled correctly, I reserve the right to fudge a little bits on the dates this all happened. I have the right to change the rules at any time. Tuesday, I was finishing up the alternate blocks (dark blocks in exothermic design) by figuring out the corners that I would need to cut off & sew down. I sewed one complete block with corners that day. or was this monday?? Wednesday, I repeated the process of flipping & cutting down the pieces that go on the corners on the remaining 11 blocks to complete. Thursday, I got a little farther in sewing the corners that I prepped on Wednesday, sewed 8 of 11 on. Friday, I finished up sewing all the corners on the blocks. Saturday was figuring out how to best piece the side block, I had to cut out the templates, tape together the paper pieced portion (oh why didn’t I use washable glue? ), sew strip sets for the graduated look of the block, cut down the strips for paper piecing the block. Sunday, I had less time to sew than I had planned, I got all the pieces together and had my puckers on the side block, but I did measure, and it is staying w/in the 45 degress of an isoceles right triangle. 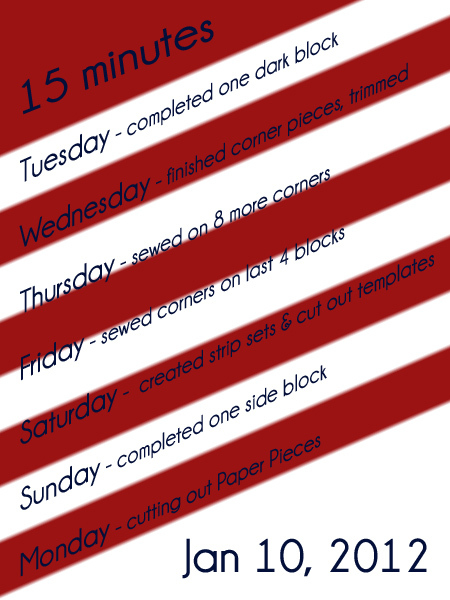 Monday, back at work, I started cutting the paper piece templates for the rest of my 13 side blocks I need to make. Cutting these at lunch did eventually lead to 15 minutes of work, no sewing, but sewing prep and that counts. That’s my first 15 minute challenge post. Welcome to the 15 minutes challenge. A really good week for your first effort at working in 15 minutes of sewing time. I like your rules. Some weeks it’s all about the prep. Good luck with your plans for the March Along. Thanks for linking up this week, hope to hear from you regularly. Looks like you had a pretty organised and crafty week to me. Good luck with those goals. i’ve just joined up with the 15 minute challenge myself and am making the rounds to all the other players. taking notes on how it’s done and thinking about how i want to prepare my own tuesday report card. you’ve clearly been quite busy this past week and i agree with you in that prep time (and sometimes even cleaning up time) absolutely should count.